When the London Knights made their big deadline deals this season, they traded away much more than their top four players. They traded away four players who had entry-level contracts with NHL clubs and they traded away the team’s identity. But that’s the beautiful thing about sports. When you trade away something, it’s your job to find a way of filling that hole. Somehow, with their young roster, the Knights have found a way to continue their winning ways without the likes of Robert Thomas, Cliff Pu, Sam Miletic and Max Jones. While winning hasn’t exactly been an issue since the deadline, the Knights’ identity is still foggy to those outside of the organization. But inside the room, there’s no questioning who this team is. Forget for a second that it’s his draft year. But this season has been a coming-of-age season for the Knights’ young blueliner. 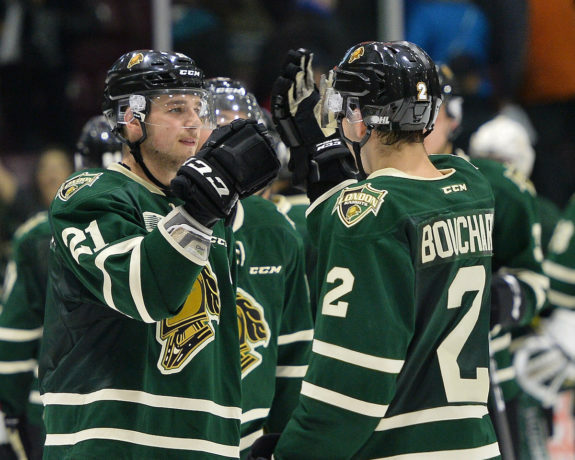 In his third season with the Knights, Bouchard has not only taken on the role of captain for this young squad, but he’s done so by letting his play do the speaking. In 53 games this season, he has 18 goals and 67 points for London – good enough for the team lead in goals, points, power play goals, game-winning goals and overtime goals. 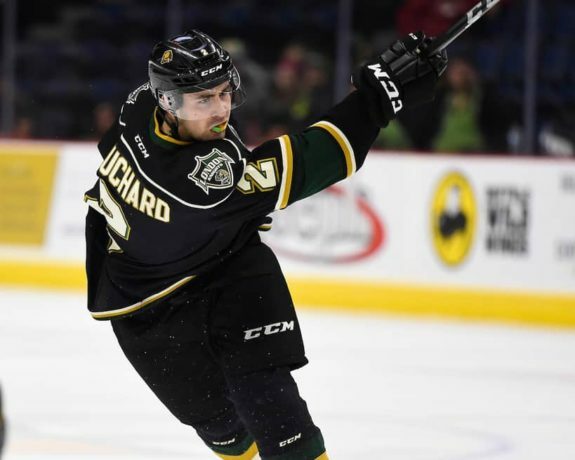 But for Bouchard, a player who experienced an OHL championship run with the Knights in his rookie season, it’s not about individual stats as much as it’s about keeping this team competitive – even without the likes of their former top four players. The Knights are fortunate to have Bouchard manning their blue line, as the 18-year-old was ranked fifth on the NHL Central Scouting’s most recent list. His intelligence in all areas of the game has made him a strong defender, a great puck mover and a threat on the offensive end with his booming slap shot. But with the moves, the Knights needed much more than just Bouchard to step up. Enter Liam Foudy. 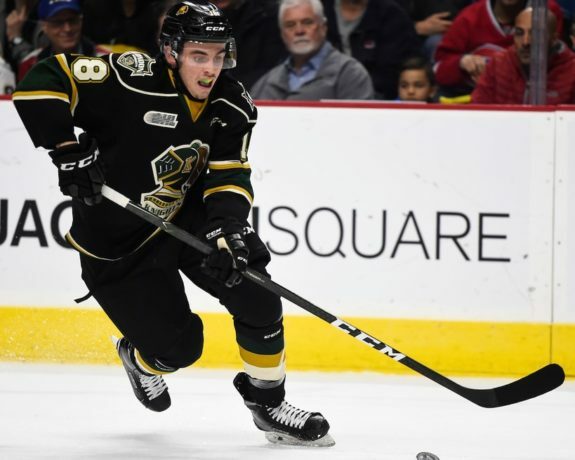 In his second season with the Knights, Foudy has already eclipsed his numbers from last season in goals, assists and points – doing so in seven fewer games. Also in his NHL draft year, Foudy’s had an opportunity to play in the NHL/CHL Top Prospects Game and develop his overall game with Dale Hunter giving him more ice-time. In return, Foudy’s put up 25 points in 51 games helping the Knights to second in the OHL’s Midwest Division and fourth in the Western Conference. But with that, Foudy’s also become one of the veterans on this young squad. And while outsiders continue to look for an identity with this team, Foudy says the players know exactly who they are and what they are capable of. With the team on the verge of yet another playoff appearance, this season becomes a piece in the development of these young players. While an appearance in the Conference Final would be a major stretch, the experience this team will gain from a postseason appearance alone shouldn’t be undervalued. After all, the best way for this team to showcase their new identity is to do so in the OHL postseason.